And…it’s another week is with good stash! Strangely enough, my wallet isn’t screaming bloody murder at me for buying so many books this week — maybe it’s because I got some extra funds from my freelance work. It’s not enough to get myself custom laptops, but it’s enough to get new books! :) That, and I got myself a Fully Booked discount card, so yay! Fleeing before a relentless army, Todd has carried a desperately wounded Viola right into the hands of their worst enemy, Mayor Prentiss. Immediately separated from Viola and imprisoned, Todd is forced to learn the ways of the Mayor’s new order. But what secrets are hiding just outside of town? And where is Viola? Is she even still alive? And who are the mysterious Answer? 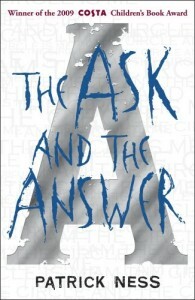 And then, one day, the bombs begin to explode…”The Ask and the Answer” is a tense, shocking and deeply moving novel of resistance under the most extreme pressure. I wasn’t planning to buy any book this week, but Fully Booked sent me a message and told me my book is there…so I couldn’t just not get it. I also got my discount card that day, so I got another 5% off from the book. Awesomeness. California high school student Audrey Cuttler dumps self-involved Evan, the lead singer of a little band called The Do-Gooders. Evan writes, “Audrey, Wait!,” a break-up song that’s so good it rockets up the billboard charts. And Audrey is suddenly famous! Now rabid fans are invading her school. People is running articles about her arm-warmers. The lead singer of the Lolitas wants her as his muse. (And the Internet is documenting her every move!) Audrey can’t hang out with her best friend or get with her new crush without being mobbed by fans and paparazzi. Take a wild ride with Audrey as she makes headlines, has outrageous amounts of fun, confronts her ex on MTV, and gets the chance to show the world who she really is. These are the secrets I have kept. This is the trust I never betrayed.But he is dead now and has been for more than forty years, the one who gave me his trust, the one for whom I kept these secrets. The one who saved me…and the one who cursed me. So begins the journal of Will Henry, orphaned assistant to Dr. Pellinore Warthrop, a man with a most unusual specialty: monstrumology, the study of monsters. In his time with the doctor, Will has met many a mysterious late-night visitor, and seen things he never imagined were real. But when a grave robber comes calling in the middle of the night with a gruesome find, he brings with him their most deadly case yet. Critically acclaimed author Rick Yancey has written a gothic tour de force that explores the darkest heart of man and monster and asks the question: When does a man become the very thing he hunts? The day after I got my freelance pay, I had this weird urge to go to the bookstore. Okay, it’s not weird, but there’s the urge. I really just intended to browse, but then I saw Audrey, Wait! and I know there were good reviews for that, then I saw The Monstrumologist and remembered it was posted on the Fully Booked newsletter. Looked promising. I had to debate between that and The Demon’s Lexicon by Sarah Rees Brennan, but the cheaper book won. Andi is short. And she has lots of wishes. She wishes she could play on the school basketball team, she wishes for her own bedroom, but most of all she wishes that her long lost half brother, Bernardo, could come and live in London, where he belongs. Then Andi’s biggest wish comes true and she’s minutes away from becoming someone’s little sister. As she waits anxiously for Bernardo to arrive from the Philippines, she hopes he’ll turn out to be tall and just as mad as she is about basketball. When he finally arrives, he’s tall all right. But he’s not just tall …he’s a GIANT. In a novel packed with humour and quirkiness, Gourlay explores a touching sibling relationship and the clash of two very different cultures. It’s just a small story really, about among other things: a girl, some words, an accordionist, some fanatical Germans, a Jewish fist-fighter, and quite a lot of thievery. . . .
And my last purchase for the week. Highly recommended by…well, everyone, actually, so I thought it’s about time I got myself a copy. Plus I liked the sample, and the idea that the book is narrated by Death. I also have a feeling I’m going to cry in this novel — maybe it’s because of the WWII references? This is my second WWII novel (first one being The Last Time I Saw Mother by Arlene Chai, but I’m not sure if that counts). I’m in the middle of The Book Thief and it is so good! Death as narrator is an awesome idea, and he’s quite a hilarious guy :) I’m sure you’ll love it too! I’ve never heard of The Monstrumologist, but it looks really good-I might have to check it out. Hi Kelly! :) I read some pages and I thought it was hilarious. :) I can’t wait to get started on it. Oh, and I’ve seen good reviews for The Monstrumologist — good YA horror, I hear. 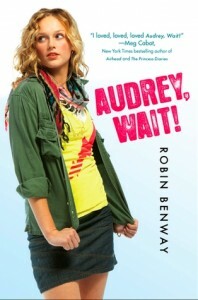 i’ve heard a lot about audrey wait! enjoy! Congrats on getting your Fully Booked discount card! Did you go to the sale for discount holders in the High Street branch? I was planning to go yesterday but it was raining so hard. I might try to go today. You finished Tall Story before I did! LOL, hope you liked it. 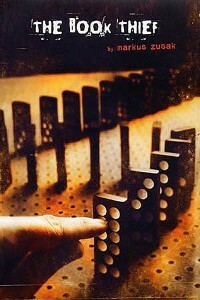 I’ve had my copy of The Book Thief since 2007 and I haven’t gotten around to reading it yet. Hope you get a copy of The Demon’s Lexicon soon, Sarah Rees Brennan is awesome. Here’s my IMM post if you want to check it out. I got stranded at Fully Booked yesterday. Spent more than I was supposed to! You’re going to love The Book Thief.